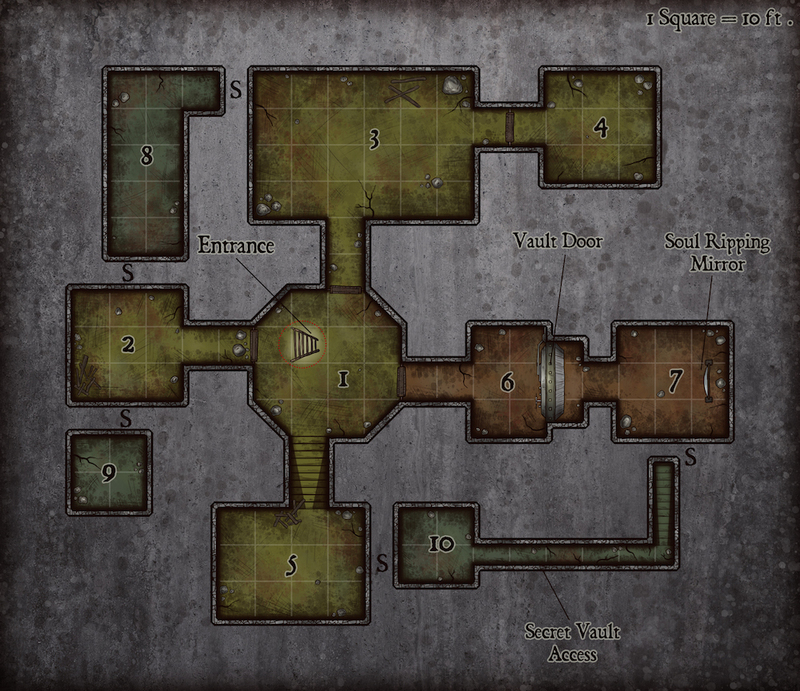 This resource features the general description of an underground vault where a powerful magic item is hidden. 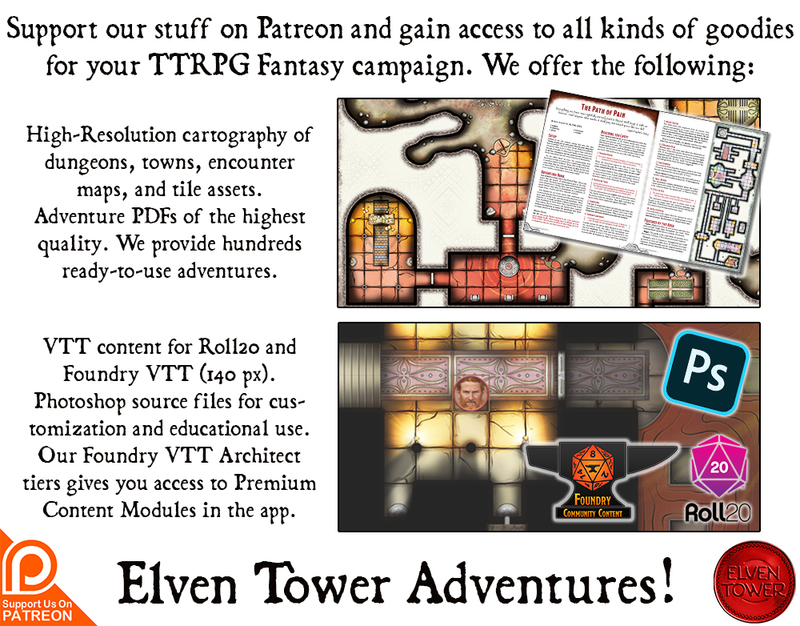 It includes adventure ideas that are appropriate for mid-level (Level 5) adventuring parties. Challenge Rating (CR) is calculated using a party of four as the model. The Soul Ripping Mirror was created millennia ago. The master crafters created it out of need. A terrible Feywild Archlord named Throstlinn threatened to overtake the Fey Courts by force. The androgynous Archlord was powerful beyond understanding. He was the physical manifestation of the ego, the force of self-image projection. After years of losing the war against Lord Throstlinn the other Fey Lords came up with an idea. They had the Soul Ripping Mirror made. A powerful Archlord had to relinquish its essence to power up the artifact. The mirror had such force they had to cover it immediately. Days later the mirror appeared in Lord Thristlinn’s Castle, as a gift. It came all bundled in fine silks. Lord Thristlinn unpackaged the present and found himself enraptured with the exquisite quality of the mirror. The egotistical nature of the Fey Lord turned out to be his worst weakness. He became obsessed with the mirror. His attuning with the mirror grew strong enough for it to activate its secret function. In a split second, the mirror glowed blue and ripped Lord Thristlinn’s soul from his physical body, storing it inside itself. The lifeless body of the Archlord fell to the ground and vanished within seconds. Future wars were averted. The remaining Fey lords went back to their usual squabbles and petty wars. The crafters intended for the mirror to become a prison for Thristlinn’s soul, a passive receptacle for his immortal soul. It did not work out that way, however. The mirror never released Thristlinn’s soul but reactivated in a different way. It was capable of capturing an additional soul only by touching the mirror. If another person touched the mirror it would capture its soul and replace it with the one within itself. It caused troubles in the Fey Courts until it was discovered how it worked. Because of Thristlinn’s soul inside and the new ability of the mirror, it was decided in the Fey Courts to have the mirror hidden and forgotten. To avoid having an innocent person buried with the mirror, a rat was presented to the mirror and it stole its soul. It was the buried in a vault. In present days, only the immortal Fey Lords remember those facts. But it is so far in the past, and so irrelevant to present affairs that most have forgotten the location of the vault. 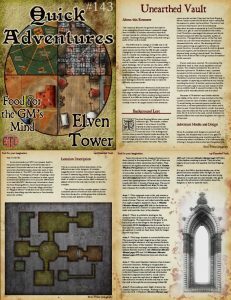 Since the underground dungeon is ancient and forgotten, the simplest way to use it in a game is to have the adventuring party stumble upon the entrance by sheer coincidence. It is a railroad-y way of doing it, but great discoveries have happened this way in real life. As an alternative, an NPC can present itself to the party with knowledge of the whereabouts of said vault. Since information is so old, it’s appropriate to have bad information about the vault or very few facts about it. The NPC can claim to know the location of an “Underground Vault”, implying a vault of treasure. The promise of treasure is often a good motivator for adventurers. It is up to the DM whether to have this NPC disclose any information about the Soul Ripping Mirror. Good storytelling would be to only reveal that a “Powerful Magical Artifact” or “Magical Mirror” is hidden in the vault, without actually describing any information or functionality about the artifact. This is a concise and brief description of the different areas in the dungeon. It includes suggestions for monster encounters appropriate for level 5 adventuring parties. The underground complex is only accessible through an unearthed shaft. A ladder or ropes can be used to descend to Area 1, which is the only way to enter or exit the complex. The chambers of this complex appear to have contained pieces of furniture and other stuff, but they have decayed to nothingness after millennia. Some rocks and splinters remain. Several locations in the dungeon feature secret doors (noted in the map with an “S”) All of them are slide sideways when opened and are hidden. They appear to be regular sections of the wall. A Passive Wisdom (Perception) score of 16 reveals the irregularities in the stone bricks, suggesting the presence of a movable section. A character looking for the activation mechanism must succeed a DC15 Wisdom (Investigation) check to find the fake brick that covers the opening button. All secret doors close automatically after 1 minute of being open. The secret door that connects Area10 and Area 7 is the only way to bypass the reinforced vault door in Area 6. Area 1 – This octagonal room is the only entrance to the complex. The three doors in this chamber are made of stone. They are not locked and slide easily if enough strength is applied to them. 2 Wraiths (Monster Manual, page 302) hide in the darkness and attack the first creature to come down from the shaft and touch the floor of the chamber. Area 2 – There is a skeleton leaning on the northeast wall of this room. It is still wearing traveling gear. The appearance of the gear is old but not as old as the things in the dungeon. A successful DC12 Intelligence check reveals the fact that since the leather in the skeleton’s gear has not decayed yet, it could not have been there for longer than twenty years. Area 3 – This large chamber is covered with bones. The ossuary has a faint magical aura that comes to full strength whenever a living creature finds its way to the center of the chamber. The bones on the floor levitate and rearrange themselves, reforming undead skeleton warriors. 3d6 Skeletons (Monster Manual, page 272) and 1d2 Minotaur (Monster Manual, page 273) Skeletons form and attack any visitors. Area 5 – Descending a short flight of stairs, the chamber appears to be empty. Nothing is farther from the truth. 2 Shadows (Monster Manual, page 269) and 2 Ghosts (Monster Manual, page 147) hide in the shadows waiting to attack. They are what lingers of past souls entrapped by the Soul Ripping Mirror. It is up to the DM to decide whether one of the ghosts becomes amiable after the fight. In such case the ghost would not be destroyed after being defeated, it would only become friendly. The ghost may give the adventurers information about the dungeon or how to open the vault. Area 6 – This chamber is blocked by the vault door. The door is circle-shaped. It appears to be made of grey stone. Upon closer inspection, it is apparent that the material it is made of is not stone, but rather a type of opaque crystalline material. It is impervious to all types of damage. There are some gears and levers protruding from the door. They can be manipulated in a very precise combination of movements to open the door. The specific combination is not in this room. It is up to the DM to determine if the combination is available in a different location as suggested in Area 4 or Area 5, or if there is simply no way to open this door. Area 7 – The Soul Ripping Mirror is here. It is twelve feet tall and half a ton heavy. Its surface glass gives the impression of ripples traveling from one side of the mirror to the other. It radiates a faint transmutation magic aura if examined with a Detect Magic spell. A successful DC 20 Intelligence (History) check or a Legend Lore spell reveals the name of the artifact and its ability to steal souls. It does not reveal the replacing soul mechanism or any lore about its Fey origin. If an adventurer touches the surface of the mirror, it glows blue and activates. The mind and soul of the person who touched the mirror are trapped in the mirror. It is replaced by the last soul trapped in the mirror, which was a rat’s. To an observer, it will appear as if the person touching the mirror is suddenly taken aback. His mind and personality suddenly reduced to animalistic behavior. The rat’s mind now resides in the adventurer’s body. If another adventurer touches the mirror then another swap of souls will occur. This process can get out of hand fast, the DM can determine a cool-down period for the mirror to work again. It is up to the DM to determine how to magically reverse the effect of soul swapping. It is advised to use a Greater Restoration spell, or even a more powerful spell. Area 8 – This secret passage connects Area 2 and Area 3. It is up to the DM to assign any creature encounter or treasure to this room. Area 9 – The walls of this small room are full of funerary niches. The inscriptions in the stone slabs have all faded beyond readability. Area 10 — This secret passage connects Area 5 and Area 7. It is up to the DM to assign any creature encounter or treasure to this room. This secret tunnel may be the only available option to reach the inside of the vault.